There’s something extra special about the symbols in this game. Not only are the fruit and as such, extremely good for you, but they are also crystals as in 243 Crystal Fruits the symbols in question sparkle and shine across the reels. Hop on and experience the fun as you check out the new UK slots at Slots Baby like this one! But there are ordinary latest online slot games, with modern gameplay and an exciting twist on the traditional format of the online slot. 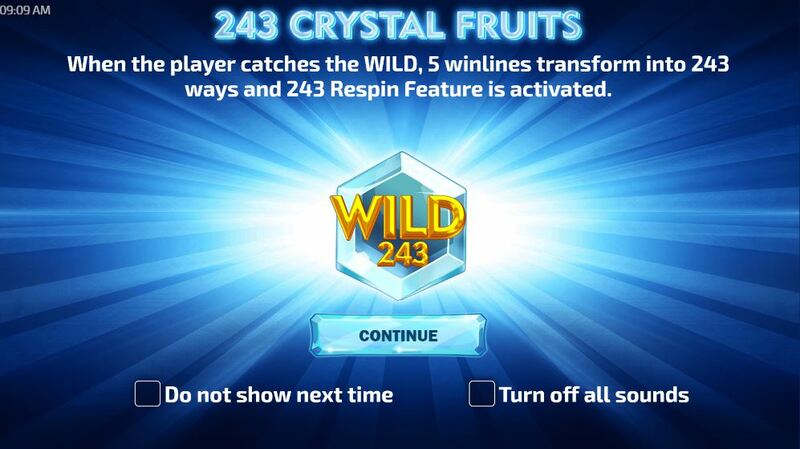 Tom Horn Gaming is a developer of 243 Crystal Fruits and they have done a really good job to come up with a slot with such original and compelling gameplay. Graphics, in terms of the backdrop at least, have intentionally been left simple to allow for smooth animations of these wonderfully glistening fruits on which this game revolves. As a company Tom Horn are dedicated to making their games as unique and entertaining as possible with a clear passion for playing games, themselves and that really comes across in this one. Get the best out of our bonus spins before you play the game! 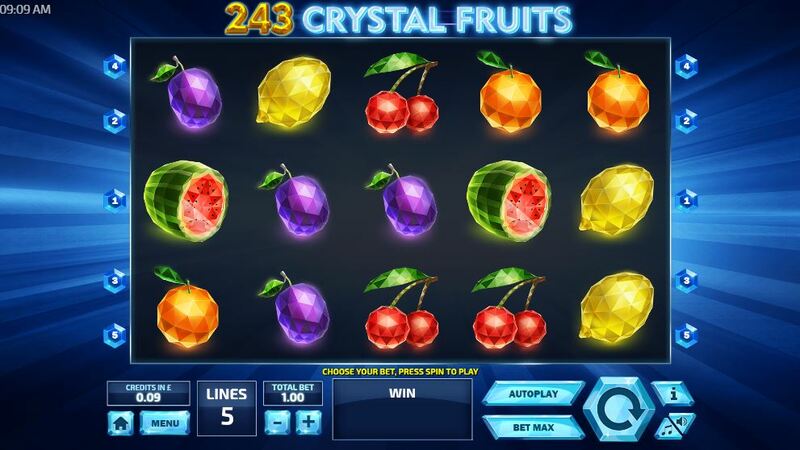 Using fruit as the symbols is a fairly common aspect on slot games but here there’s an added twist as they sparkle and glimmer across the 5 reels and 5 pay lines - and you’ll still benefit from getting your 5 a day from 243 Crystal Fruits. Such a small amount of pay lines makes this is a very simple slot in spite of it’s more original, complex layout. This opens it up to gamblers of all levels and gamblers of all budgets, with the empha-sis as much on fun here as it is on big cash prizes. Betting starts at 5p and goes up to £10, so despite the low entry level point, there is quite a big scope there for players to find their range. However, with a maximum bet of a tenner, maybe the high rollers among us will look elsewhere for a big win. There are no bonus features in this game in regards to free spins and re-spins, but there are cascading wheels that cause some excitement. This means that those symbols included in a win disappear from the board, leaving gaps behind that need to be filed. New symbols cascade down from above and the whole set of symbols drops down to fill in the spaces left. What’s good about this is that it creates new lines to play on and, more importantly, it creates the potential for more wins, too. Every time there’s a cascade win a multiplier increases by x1, which will go up to a maximum of x5. It’s here where your bigger wins are to be made. The game can be enjoyed on both PC and Mac, as well as on Android, iPhone and tablets, making for a good game to play on-the-go.